This is a 3000 sq. 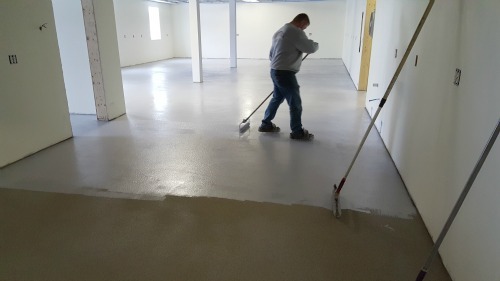 ft. epoxy floor we installed in a commercial building in Lewiston, Me. This epoxy floor system included a double broadcast of silica sand. Adding silica sand to the epoxy increases its strength and durability. 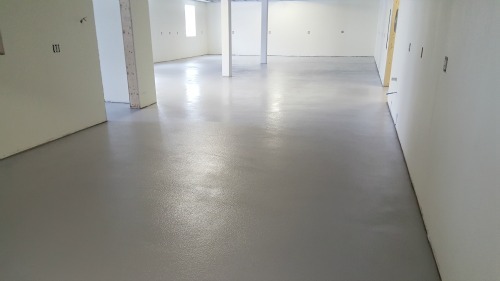 This kind of epoxy floor is great for commercial buildings, warehouses, fire stations, and vehicle service stations. 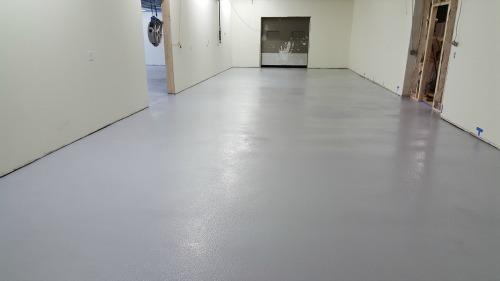 It's a very durable and easy to maintain epoxy floor that will hold up to heavy vehicle traffic, forklift traffic and lots of foot traffic. The concrete floor in these two rooms was in pretty bad shape and needed some repairs before we could apply the epoxy. We had a lot of cracks to repair and we also had to level out some low spots. The darker areas in the picture above were some low spots in the floor. Some of these spots were up to an inch low. We used a self-leveling concrete repair material to level these areas. 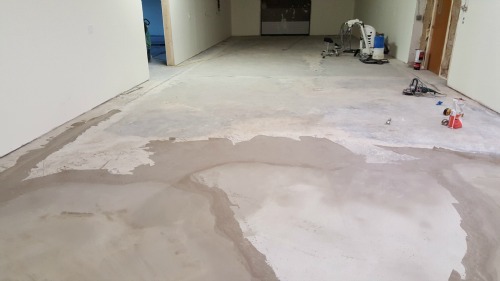 We repaired all the cracks with our epoxy crack repair material, then we ground the concrete with our floor grinders to prepare the concrete for the epoxy coating. This epoxy floor was a four coat system. The first coating was a moisture blocking primer coat of epoxy. In the next two coats of epoxy we broadcast silica sand into the wet epoxy. The sand adds strength, thickness and texture, making this epoxy floor system very durable, slip-resistant and easy to maintain. The fourth and final coat was our 100% solids grey epoxy top-coat. As you can see, the finished epoxy floor was quite an improvement over the original concrete floor. The owner can now use this space for whatever he chooses to. 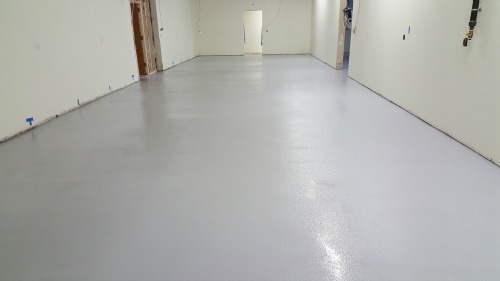 If you're looking for an epoxy flooring contractor in Maine, you can request a quote from us and we'll set up a time to come take a look at your floor. We install a lot of epoxy floors in Maine. A lot of our epoxy applications are in garages and basements. We have a lot of solid colors and designer colors of epoxy to choose from. Here's our color charts.